The shoulder blade (scapula) is a large membranous bone involved in shoulder motion and stabilization. The scapulae moves on the back of the chest wall (posterior thorax) to account for one third (1/3) of shoulder motion. Disorders of this scapulothoracic mechanism result in pain, weakness and dyskenesis (painful motion) or the shoulder and shoulder blade. The clicking or grinding may be associated with the disorder and hence the term snapping scapula. The scapula and arm are connected to the body by multiple muscle and ligament attachments. 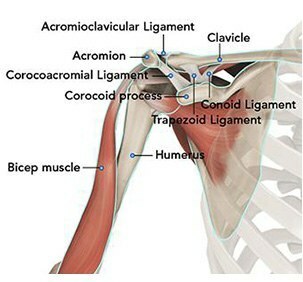 The front of the scapula (acromion) is also connected to the clavicle (collarbone) through the acromioclavicular joint. The scapula serves as a site for the attachment of multiple muscles around the shoulder. Patients with scapulothoracic disorder often report pain. The pain may be activity related—particularly with overhead activity. The pain is typically along the posterior aspect of the shoulder along the medial border of the scapula. Patients often with snapping scapula complain of popping/grinding or clicking at the scapula. This is in contrast to Pain with rotator cuff tears is often worse at night. Some studies have suggested this association is because the pain receptors in the shoulder are sensitive to pressure—with these receptors sensing more pressure with patients lying horizontal to sleep, as opposed to upright during the day. After reviewing the patient’s symptoms, a review of their pertinent medical history and family history is obtained. 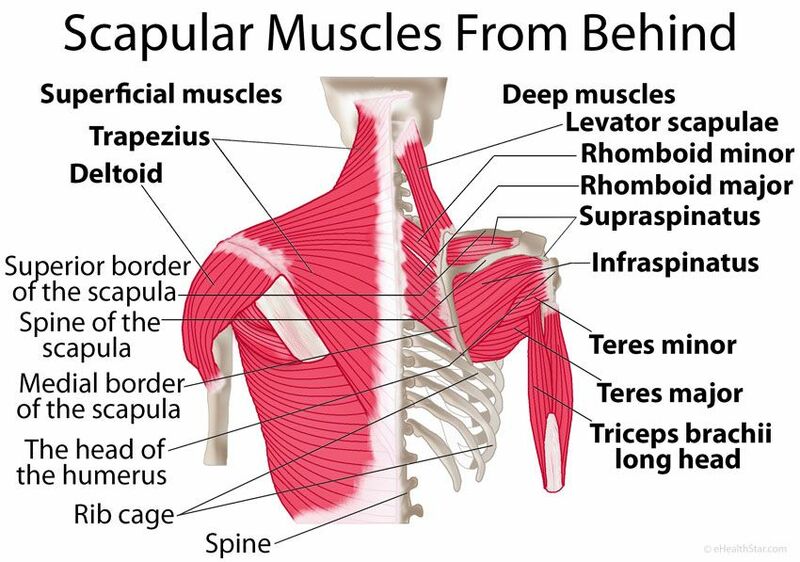 The range of motion of the shoulder is measured in multiple planes. The strength of the shoulder in resisting motions is tested. The neck is examined to determine if any overlying nerve impingement may be causing shoulder pain and dysfunction. Palpation of the shoulder blade with motion may allow the surgeon to feel the popping/grinding associated with snapping scapula. X-rays of the shoulder are typically utilized for evaluation. Although rare, bony exostosis may arise underneath the scapula causing mechanical irritation of the shoulder blade. Although x-rays do not image the soft tissue of the muscles stabilizing the scapula, they can add information regarding the presence of arthritis, fracture or dislocation. Typically, advanced imaging such as MRI or CT is not needed for evaluation of scapula disorders or snapping scapula. Nonoperative treatment is typically successful in treatment of scapular disorders. However, the length of time to accomplish these goals may be lengthy—up to 12-24 months from initial proper diagnosis and treatment. Pain and function can be improved for almost all individuals without surgery. For patients with continued pain, a steroid injection of the scapulothoracic bursae may be indicated. These injections may be done in connection with mediations listed above. 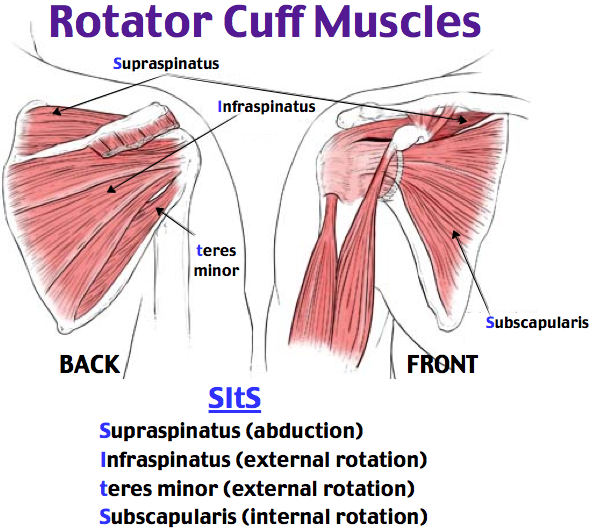 Exercise has proven a helpful adjuvant for rotator cuff tears. Exercise programs can be performed at home or under the direction of a physical therapist–Both methods appear equally effective in studies typically, shoulder steroid injections may be repeated 2-3 times per year. Risks with injection include depigmentation, tendon rupture, and infection. Operative management for scapulothoracic disorders is very rare, with most treatments directed at the rare instances of bony exostosis of the shoulder blade. Excision of the bony exostosis may be performed by a shoulder surgeon or a tumor surgeon.